Wow, did these guys knock me out! Their album BEAT MUSIC is amazing. The intricacies and details of the production are fantastic. And that sound! George Martin and Geoff Emerick couldn't have produced and engineered a better album. Yes, it is Beatles influenced, but that's just the start. After all of these years, I find that listening to this album still gets me on my feet! 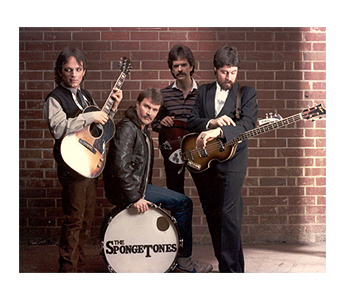 Hailing from Charlotte, NC, The Spongetones formed in 1978. The following year had the band line-up evolve into what you see today and in the music videos below. Their influence is evident in their homage to The Beatles and Mersey Beat. But there is so much more to this band. As opposed to the litter of Beatles tribute bands and sound-alikes, The Spongetones brought an original flair and high-impact energy to the music they produced. The song writing, musicianship and production is influenced and then enhanced into a new and original intensity. If the album BEAT MUSIC had been released at the end of the 60's it would have been a genuine hit. But instead an early 80's release offered national critical raves and only regional sales. Within my foggy memory and scattered notes I find that I can't remember how I connected to the band. (I would guess it was via Don Dixon who was working in the same studios in Charlotte at the time.) I do remember playing The Spongetones LP to death. I have also found within my files one receipt after another to record company execs in New York and LA. I sent out copies of my two videos trying to help get some A&R notice from one of the major labels. I discovered that critical success (and my dogmatic zeal for Spongetones music) didn't mean you received a record deal. The Spongetones are the only RTC band to continue to play to this day. They have now released 12 LPs / CDs as well as been on a great number of compilations CDs. Plus there's the solo CDs! If you're in the Charlotte area, you'll find that they are revered as local Rock Heroes - and rightfully so. And nationally as well as internationally, the critics still love them! Check out The Songetones' tour schedule and go see them perform live. They always put on a great show. The night after we shot the videos at The Pier, The Spongetones played to a packed house. They asked me if I had a request. HELTER SKELTER would normally be tops on my Beatles list, but I thought I would hit them with one that I knew they couldn't play, I AM THE WALRUS. That night, to my delight, they performed a spot-on version. I still don't know how they did it! BEAT MUSIC (LP) and the follow-up TORN APART (EP) are compiled together as one CD, RIPPED AND TORN. Find it. Buy it. Listen to it! A sneak peek Rough Cut of the Return To Comboland documentary as a work in progress. Of special note are all of the crane shots. "Fast" Eddie Barber was a news photographer (cameraman) for WTVD-TV in Durham. I rented his camera for a number of my music videos. He came to this shoot with an idea he was tinkering with in his garage. He brought out a camera tripod with an eight-foot swinging arm attached it. At one end of the arm was the camera and at the other end stood the camera operator. I was totally blown away by the gadget! (Getting a crane shot usually meant a big rig that the director and camera assistant sat on, while a couple of crew member swung you around from the other end. Eddie's boom was something simple and small and brilliant.) Eddie set the boom up for me to shoot with, but I couldn't get the hang of it. Since we were tight on time, I directed Eddie as he ran through the Ed Sullivan inspired shots. I'm telling this story because within three years, every television network and Hollywood studio were franticly buying these things from Eddie. He called it the Barber "Baby" Boom. I remember David Letterman, when he was on NBC, demanding a shot of the studio and telling the audience that NBC just bought three of these Barber Booms from a guy who was making them in his garage in Durham, North Carolina. HERE I GO AGAIN was the first time a Barber Boom was ever used in a television production. It's a simple video, but historic. And, hey, the music is great too! Since concept videos were all the rage in 1983, I thought I would take a left turn just past Richard Lester's (director of A HARD DAYS NIGHT) jump-cut style of cinema and make most of the video still frame jump-cuts. A few years later when I was directing videos in Nashville, I promoted the idea again with some Country artists, but I was beat to the punch with a video that was shot as still photographs and edited together. That video won high praise and was considered very hip in 1988 - five years after SHE GOES OUT WITH EVERYBODY. In casting The Girl in this video, I was going to go back to Sara Lynn Moore, who had worked on Glass Moon's ON A CAROUSEL and briefly in SIMON. But I ran across a girl who had the Patti Boyd hair cut and the vintage 1967 Mary Quant Sgt. Pepper's dress (and I was dating her at the time). Hired! The 1966 Mustang was the car I bought after graduating High School and drove from New York to Raleigh. The daylight apartment is Joanie's. The nighttime apartment is mine. The dog is her's. The TV was bought with my paper route money in 1969. And the kids were rented. Let's not forget Jamie Hoover, playing The Guy - looking dapper in his skinny tie - and The Pier as the location. For those of you who remember The Pier, you'll enjoy see the club entrance and it's fish netting on the wall, part of the dance floor in front of the stage and that famous stage, littered with gaffers tape. Also of note is the North Carolina State University cafeteria. These two videos were shot in two very, very long days. 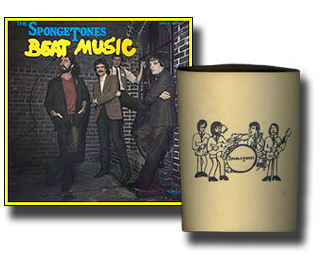 Above: BEAT MUSIC LP Cover & Spongetones Beer Cozy (1983). 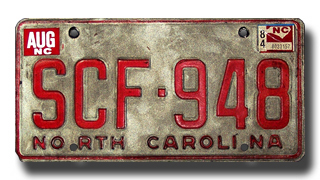 Below: The SHE GOES OUT WITH EVERYBODY 1966 Mustang was sold in 1984, but the licence plate is still around. 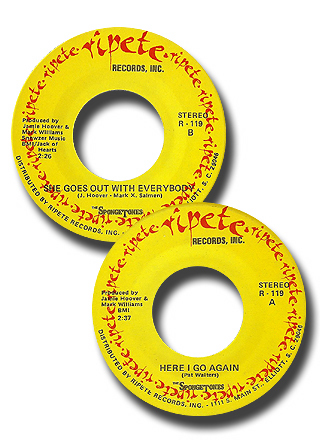 Above: The A and B side labels to The Spongetones single. Below: I'm an Offical Spongetones Fan button (1983).